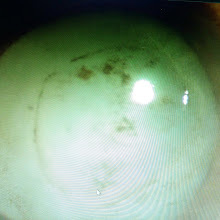 33 year old s/p retinal detachment surgery with gas presents with increasing pain and white mature cataract. Her IOP was 43 mm Hg. What is the diagnosis? The clinical photo is suggestive of phacomorphic cataract with pupillary block glaucoma. The treatment is to perform a phaco/PCIOL combined with pupillary and angle syncheiolysis.